The bamboo rooms of the eco-village are situated among the coconut palm grove of The Mandala. They are perfect budget accommodations and an excellent alternative to a traditional guest house or beach hut. Equipped with extremely comfortable beds, definitely the best in north goa for a hut, and for the price, they have standing fans, chill-out porches, mosquito nets, standing fans. They share well designed communal showers and toilets. Twin or double available - please enquire availability ! The bamboo-clad rooms of The Mandala's eco-village are suited to couples or singles. Each sleeps a maximum of two people. 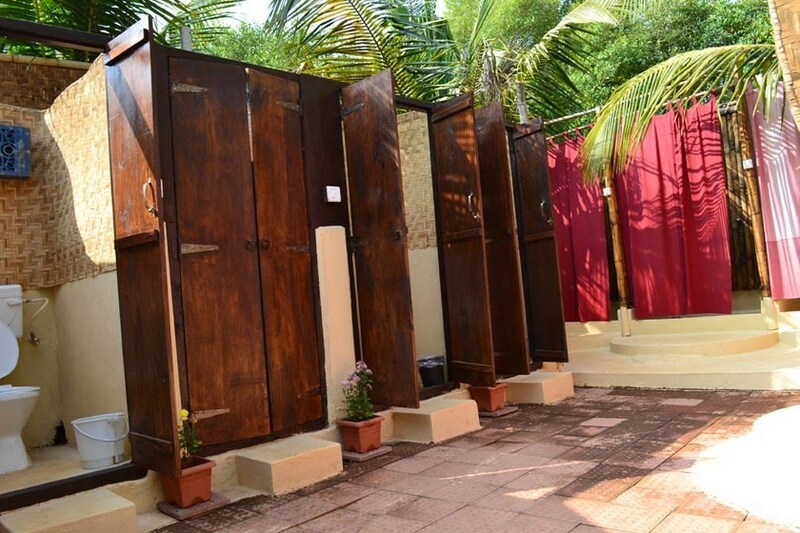 The rooms of the eco-village share tastefully designed, clean common bathrooms and are set amongst abundant greenery, the perfect distance away from the sea to hear the gentle lapping of the waves on nearby Mandrem Beach. Extra Beds may be available, please enquire !